The Jacksonville Jaguars are in new territory this season. After last year’s run to the AFC Championship game, they are no longer expected to be the league’s doormat. Now people actually expect them to win games. Kansas City, on the other hand, was a team people had questions about entering this season. They have since proven they are a force to be reckoned with. But how far can they go without getting much help from their defense? How the season is going to play out for either remains to be seen, of course, with 75 percent of the regular season remaining. But fan will get a good idea where both are at when the Chiefs visit the Jaguars Sunday afternoon. The matchup will essentially come down to one thing—is Jacksonville’s defense better or is Kansas City’s offense the more dominant unit? The Jags live and die by their defense and with good reason—they have one of the best in the league. They are currently the No. 2 overall unit in the league behind the Washington Redskins. Against the pass, they are No. 2 and against the run, No. 11. But they are the best in the league in the stat that counts the most—points allowed per game (14.0). The Chiefs offense is certainly a formidable one. Patrick Mahomes is easily the hottest quarterback in the NFL this season proving the team was right to trade Alex Smith away. Of course, it helps that he has a great stable of weapons at his disposal in Tyreek Hill, Kareem Hunt, Travis Kelce, and Sammy Watkins. But the team is aware of the caliber of defenses they have faced relative to the one they’ll see Sunday. Everyone is going to watch this one to see how the Chiefs offense does against the Jaguars defense. But the deciding factor is more likely going to be how the Jaguars offense does against the Chiefs defense. The Chiefs defense showed marked signs of improvements last week against the Broncos. 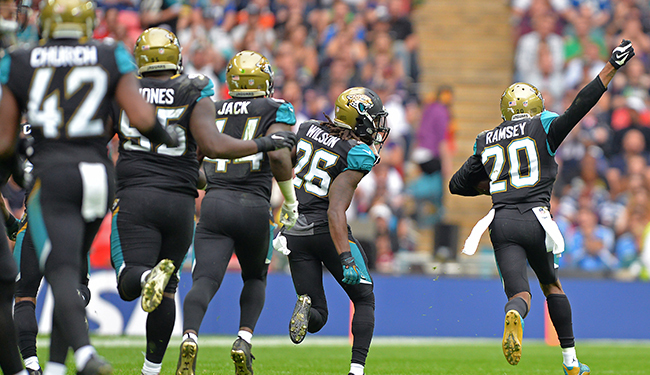 Blake Bortles and the Jags offense has had its moments. But they will be without Leonard Fournette again. That means the team is going to lean more on Bortles—which can be fine but also disastrous. The Chiefs will probably try to figure out what the Titans did to hold the Jags to just six points in Week Three. This will be a fun, entertaining game to watch. But in the end, look for Jacksonville fans to be smiling more than Chiefs fans. The Jags offense will be able to exploit the holes in the Chiefs defense. Mahomes and company will struggle against the Jags defense. The Chiefs are favored by three but take the Jaguars and the points.